After a short hiatus I am very excited to dive back into the world of blogging and especially excited to pick up our Frauen Friday series! If you are new to the blog, Frauen Friday was started with the hopes of providing more exposure to the amazing female scholars, authors, academics, pastors, laypersons, and so on. Thus far I have featured Mercy Amba Oduyoye, Beverly Gaventa, and Elsa Tamez. I am hoping to pick up the pace a bit and have a Frauen Friday post every Friday this summer–I’ll try my best to do so! “Adele Berlin, now professor emerita, was the Robert H. Smith Professor of Biblical Studies at the University of Maryland. She taught at Maryland since 1979 in the Jewish Studies Program, the Hebrew Program, and the English Department. Her main interests are biblical narrative and poetry, and the interpretation of the Bible. While at Maryland, Professor Berlin served as Director of the Joseph and Rebecca Meyerhoff Center for Jewish Studies (1988-91), held the position of Associate Provost for Faculty Affairs (1994-97), and was Chair of the University Senate for the 2005-2006 academic year. I was first introduced to Berlin’s work during my undergraduate studies in Hebrew when we got to reading poetry. 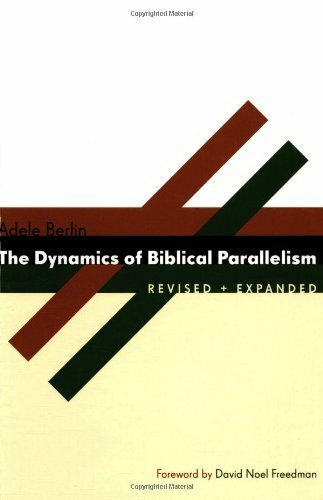 In The Dynamics of Biblical Parallelism, Berlin seeks to “provide a linguistic framework for the study of parallelism,” (xvii). The majority of the book focuses on a number of different linguistic categories (the grammatical aspect, the lexical and semantic aspects, and so on) and concludes with a look at parallelism within the biblical texts. This book is incredibly helpful and if you are a reader of Biblical Hebrew you should definitely own this book. “It is ironic that, although telling is so important in the biblical tradition, there is no word for story. There are words for songs and oracles, hymns and parables… other than a term like תולדות (‘genealogy, history’) applied to a few narrative sections, there is nothing to designate narrative per se. Yet the Bible abounds with narrative–vibrant and vivid narrative that has an ongoing power to affect those who hear or read it. Its power comes not only from the authority of scripture, but from the inner dynamics of the stories themselves. This book will explore some of those inner dynamics, some of the inner workings of biblical narrative,” (11). “the result in all of these cases is an indirect presentation of David, in which various aspects of his character emerge naturally, outside of the glare of direct scrutiny. These episodes are then combined, in the mind of the reader, with the episodes in which David is the main character,” (33). “the purpose of character description in the BIble is not to enable to the reader to visualize the character, but to enable him to situate the character in terms of his place in society, his own particular situation, and his outstanding traits–in other words, to tell what kind of a person he is,” (36). Descriptive terms help the reader see a character the way the author intends him or her to be seen and understood. The book also covers other topics such as point of view as well as how poetic interpretation relates to historical-critical methods of interpretation. Again, I highly recommend this book as I have found it very helpful in my own reading of scripture. Thank you for this wonderful profile of the work of Adele Berlin! I first discovered her in preparing to speak on the Book of Ruth and her insights into Ruth as story were eye-opening to me.